Recently, researchers have been incorporating graphene-based materials into superconducting quantum computing devices, which promise faster, more efficient computing, among other perks. Until now, however, there's been no recorded coherence for these advanced qubits, so there's no knowing if they're feasible for practical quantum computing. In a paper published today in Nature Nanotechnology, the researchers demonstrate, for the first time, a coherent qubit made from graphene and exotic materials. These materials enable the qubit to change states through voltage, much like transistors in today's traditional computer chips—and unlike most other types of superconducting qubits. Moreover, the researchers put a number to that coherence, clocking it at 55 nanoseconds, before the qubit returns to its ground state. "Our motivation is to use the unique properties of graphene to improve the performance of superconducting qubits," says first author Joel I-Jan Wang, a postdoc in Oliver's group in the Research Laboratory of Electronics (RLE) at MIT. "In this work, we show for the first time that a superconducting qubit made from graphene is temporally quantum coherent, a key requisite for building more sophisticated quantum circuits. Ours is the first device to show a measurable coherence time—a primary metric of a qubit—that's long enough for humans to control." There are 14 other co-authors, including Daniel Rodan-Legrain, a graduate student in Jarillo-Herrero's group who contributed equally to the work with Wang; MIT researchers from RLE, the Department of Physics, the Department of Electrical Engineering and Computer Science, and Lincoln Laboratory; and researchers from the Laboratory of Irradiated Solids at the École Polytechnique and the Advanced Materials Laboratory of the National Institute for Materials Science. But this flowing current consumes a lot of energy and causes other issues. Recently, a few research groups have replaced the insulator with graphene, an atom-thick layer of carbon that's inexpensive to mass produce and has unique properties that might enable faster, more efficient computation. To fabricate their qubit, the researchers turned to a class of materials, called van der Waals materials—atomic-thin materials that can be stacked like Legos on top of one another, with little to no resistance or damage. These materials can be stacked in specific ways to create various electronic systems. Despite their near-flawless surface quality, only a few research groups have ever applied van der Waals materials to quantum circuits, and none have previously been shown to exhibit temporal coherence. 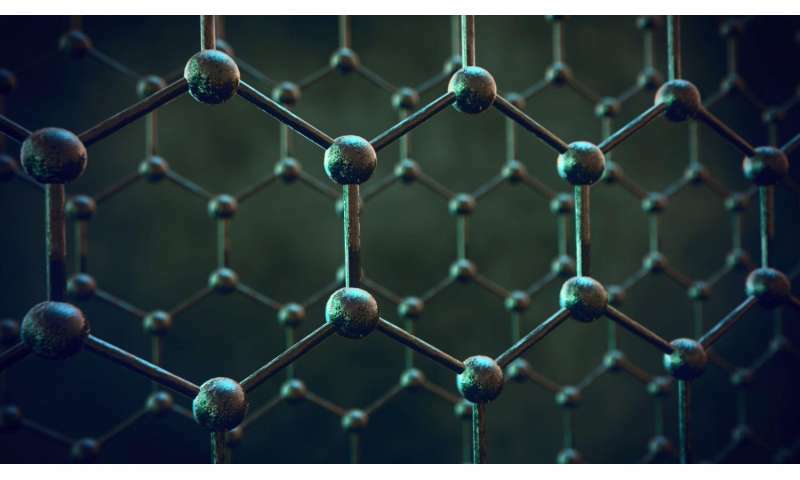 For their Josephson junction, the researchers sandwiched a sheet of graphene in between the two layers of a van der Waals insulator called hexagonal boron nitride (hBN). Importantly, graphene takes on the superconductivity of the superconducting materials it touches. The selected van der Waals materials can be made to usher electrons around using voltage, instead of the traditional current-based magnetic field. Therefore, so can the graphene—and so can the entire qubit. The work can help tackle the qubit "scaling problem," Wang says. Currently, only about 1,000 qubits can fit on a single chip. Having qubits controlled by voltage will be especially important as millions of qubits start being crammed on a single chip. "Without voltage control, you'll also need thousands or millions of current loops too, and that takes up a lot of space and leads to energy dissipation," he says. Additionally, voltage control means greater efficiency and a more localized, precise targeting of individual qubits on a chip, without "cross talk." That happens when a little bit of the magnetic field created by the current interferes with a qubit it's not targeting, causing computation problems. For now, the researchers' qubit has a brief lifetime. For reference, conventional superconducting qubits that hold promise for practical application have documented coherence times of a few tens of microseconds, a few hundred times greater than the researchers' qubit. But the researchers are already addressing several issues that cause this short lifetime, most of which require structural modifications. They're also using their new coherence-probing method to further investigate how electrons move ballistically around the qubits, with aims of extending the coherence of qubits in general.